Eccleshall CFRs were double recipients at this year’s “Excellence in the Community Awards”. The ceremony, organised by West Midlands Ambulance Service took place last week in Brierly Hill. 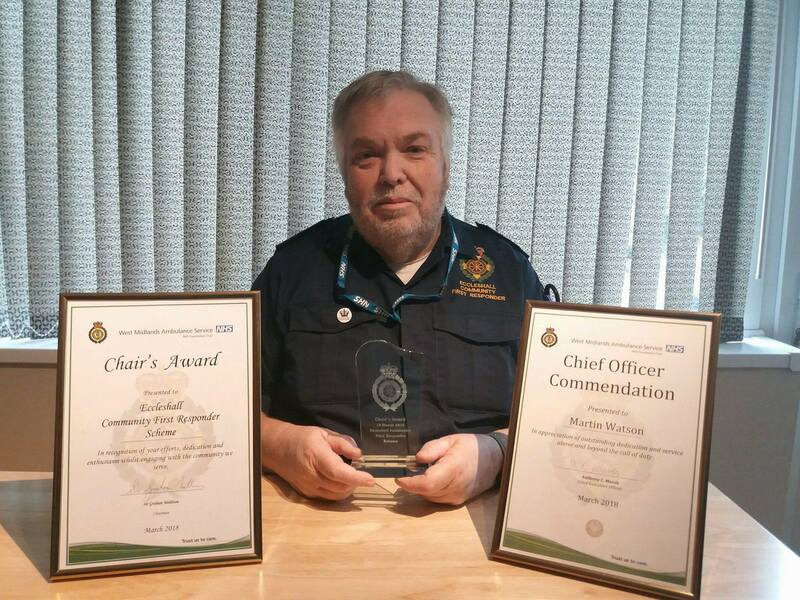 Responder and Group Co-ordinator Martin Watson received a “Chief Officer Commendation” which was presented in recognition of his part in successfully resuscitating a patient in December last year. The patient had suffered a cardiac arrest whilst outside but after a period of CPR and the use of an on-site defibrillator was successfully resuscitated and has since gone on to make a full recovery. Martin Watson said this was a great night for Eccleshall First Responders and it is nice to receive recognition for the hours that the members of the team dedicate to the people of Eccleshall and surrounding villages. It is a fantastic achievement for the whole team including fundraisers and supporters.